The popular Gameloft game Modern Combat 5: is now available in Tizen Store. Right now this is the best high graphics game for Tizen smartphones. The game was launched on Android and iOS devices back in 2014 but still it is must play action game on every smartphones. This is the first person shooter game and fifth chapter in original series. Gameloft has launched their popular games Asphalt 8: Airborne, Asphalt Nitro, Minion Rush, Let’s Golf in the store. Modern Combat 5:eSports FPS is more than that because its interesting gameplay, special effects and high quality graphics makes it most addictive action game. 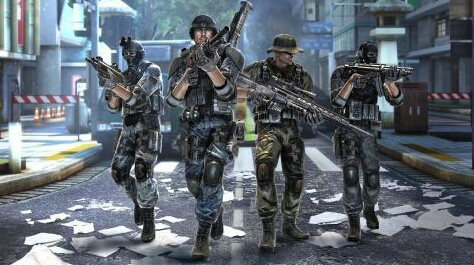 In the gameplay you can create your own squad to fight against enemies. Defeat them in every combat and protect your land. Play as a single player or go with multi-player and invite your friends to join the team. The game will give you different missions and you have to complete them within given time. Meet many cities from Tokyo to Venice to attack on enemies and to protect innocent citizens. The spectator mode allows you to watch all the players in the battle either it is single player or multi-player. The Modern Combat 5 game has different levels and different modes to examine champions. If you have gaming skills and if you can take quick decisions then only you can win the battle. The game shop will help you to upgrade your all weapons and to boost the power. You can pay gaming coins or real money to buy something from the shop. The Gameloft game Modern Combat 5 has now set new boundaries for Tizen Store. It is definitely a best game for all Tizen smartphones. Modern Combat 5 is franchise game like Angry Birds & Temple Run 2 games so you must play it. The new Tizen smartphone Samsung Z4 is now available in market so gamers can play it much better on this new device. Samsung Z4 comes with powerful hardware features and new Tizen 3.0 version will sure help it to run it extra smooth. Now go to the Tizen Store and download this game on new Samsung Z4 and Samsung Z2 smartphone as well as on older devices.